Charlie Rose isn't known for being very flashy. 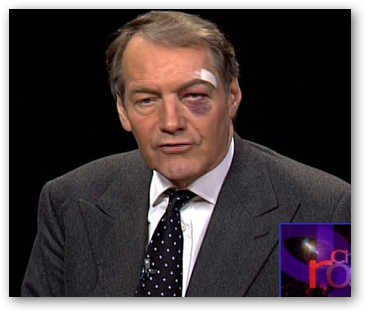 Every episode of his show features a black background with two people talking in front of it so it might have come as a shock to regular viewers to see Charlie Rose sporting a fresh black eye. TechCrunch reports that Rose got a black eye after tripping "in a pothole while walking on 59th street in Manhattan." Incidentally, he was also carrying a new MacBook Air and make the fateful decision to sacrifice his face to protect his laptop from the fall. "In doing so, he pretty much hit the pavement face first, unfortunately," they said. Luckily the MacBook Air survived the fall. "The Macbook Air is fine, he showed us the blood stains on it this morning." If you don't understand Rose's decision to shed blood for his laptop, you need to familiarize yourself with the MacBook Air. The MacBook Air is touted as the world's thinnest laptop computer and sports a 13.3 inch screen and full-size keyboard, weighing a mere 3 pounds. Although the latest episode featuring the black eye isn't available yet, you should be able to catch it on the Charlie Rose online video archive next week. I know the show is on public television, but for Christ Sakes, doesn't Charlie make enough coin to cushion the fall WITH the precious MacBook Air. I mean, look at their sponsors -- Coca Coal, all those foundations... he endorses Ralph Lauren Purple Label (wonderful sartorial sense), and he has to fall on his face rather than the frigging computer? I don't believe it for a minute. I'm guessing Charlie was nailing somebody's old lady. Charlie's shiner is result of a drug deal gone wrong with Rush Limbaugh. The master of the oxymoron wouldn't give over the oxycontin to the moron. Get a life! Charlie Rose is the greatest interviewer with the highest quality interviewees. I am glad he is safe and sound -- and not too proud to continue life despite the "image." But my favourite one is about the airport scurity confuse.